Posted December 23, 2015 by Tony Jones & filed under Books. With a leap and a bound Big Finish has opened the door on the Time War, the gap between so-called classic and modern eras of Doctor Who. Executive producer Nick Briggs has been on record many times stating the Time War could never be tackled. 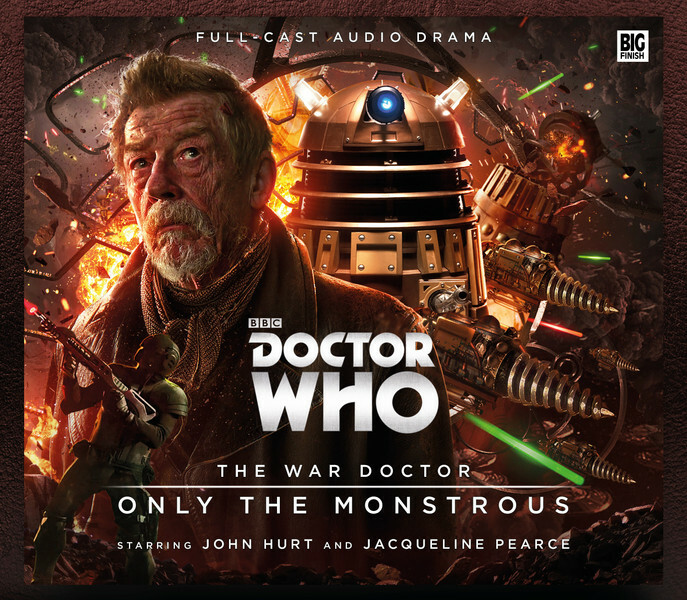 How wrong he was, and how well he demonstrates how to do it with The War Doctor Volume One – Only the Monstrous a three-disc collection of adventures for the War Doctor as played by John Hurt. Not only did Nick Briggs write this volume of stories, he also directed (and played the voice of the Daleks). John Hurt may have only appeared on screen in 2013’s anniversary special ‘The Day of the Doctor’, but by the end of this collection we feel we are starting to understand his character and looking forward to February’s next run of stories. The three stories set out the main characters: the War Doctor himself, the manipulative Cardinal Ollistra (Jacqueline Pearce), various other Time Lords and a character named Rejoice. Although he’s working closer with the Time Lords, the War Doctor is very much a maverick, hates being called Doctor and is abrasive to anyone who gets close to him. As might be imagined, Cardinal Ollistra starts off sounding like Servalan on Gallifrey, but the relationship with the War Doctor is more nuanced than any of Servalan’s. There are plenty of Daleks, slaves, ‘Invasion of Earth’-style mining operations and plenty of standard Dalek tropes. Those familiar with Nick Brigg’s 2001-2008 series Dalek Empire will also find much that is familiar, but don’t assume this is a set of rehashes of old material. Instead this is a clever story with layers of betrayal, and a lot to recommend it. Briggs’ direction is tight, yet all the actors feel convincing and fully inhabit their roles. The headline stars are a treat, as are the many Big Finish favourites making up the company. Even if you aren’t sure about the way the War Doctor was slotted into continuity, this is a set of stories to add to your collection. There’s even a martial, cinematic theme tune to help set the brand of this future classic. Extras: A fourth disc full of behind the scenes cast interviews. Released on Tuesday 24 November 2015 by Big Finish. The War Doctor BF series are among the best things they have ever done – hardly a surprise when you look at the talent and Sir John Hurt is amazing in this, delivering, as expected, a terrific performance which makes you yearn for more War Doctor stories. I hope they keep up this level of quality in the other modern Who releases. We know the River Song material is in excellent hands with Alex Kingston working with Paul McGann but I am not sure about the Churchill or 10/Donna releases. Neither of these interest me anyway and I think we can be guaranteed that the latter will be irritating at best and the former just seems unnecessary. With the stories about how neither Tennant nor Tate seemed to take the recordings seriously and spent most of it giggling like silly children and no doubt the frustration of the production team, seems like a waste of time to me when BF could be doing better and more serious stuff. Agree. These are great and everything I’d hoped for. Next up is the River Song diaries which should be equally awesome. Who’d have thought 12 months ago that BF would be able to get both Alex Kingston and John Hurt into the fold – awesome! Now we need to find a way to get Matt, Karen and Arthur back together. Further stories with the War Doctor can only ever be a good thing. I think it’s a great thing that Sir John Hurt would take time out of his busy schedule to reprise the role for us to enjoy. What a legend; that’s fan service done right! Now bring on River Song and 10/Donna. I can’t wait for those two releases to happen. Hopefully they’ll eventually get Matt, Karen and Arthur to do some stuff and then Peter and Jenna.